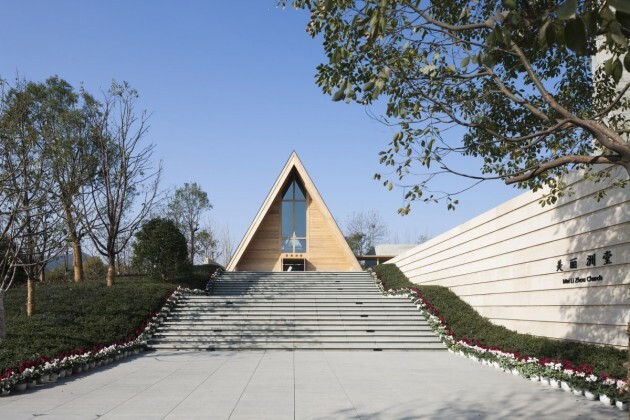 Located in a wooded development in Hangzhou China, the Mei Li Zhou Church was an attempt to merge seamlessly not only into the buildings surrounding nature, but also into the lives of those who live within its surrounding community. 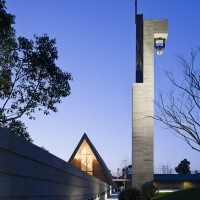 Carefully developed in coloration with TDS (Tsushima Design Studio), and our client Zhejiang Vanke, Mei Li Zhou Church was not only created for religious services, but as both a spiritual and community retreat for all of the surrounding community regardless of religious beliefs. 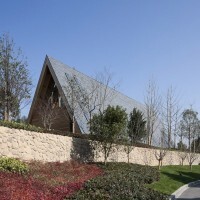 Surrounded by nature, the Mei Li Zhou Church sits not as an object to be viewed from afar, but rather attempts to blend in naturally to its existing surroundings. 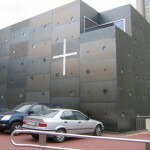 While designing the church, not only was the experience and functionality of the user of great importance, but also working with environmentally low impact materials as well as minimizing damage to the existing nature were both very important to the project’s success. 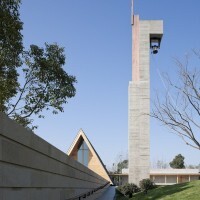 As a result of our extensive studies in the architecture in collaboration with PLAT Design in landscape, the churches boundary blurs with the surrounding landscape, allowing for a seamless flow between building and nature. 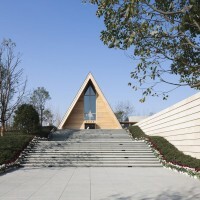 The Mei Li Zhou Church was designed with two overwhelming themes. First the creation of a seamless flow of space between the interior spaces and nature, while the second looks at the idea of timelessness and purity. 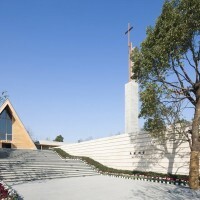 The church complex consists of three separate, yet connected buildings (The Mei Li Zhou Chapel, The smaller Garden Chapel, as well the Courtyard Offices) and one bell tower. The two smaller buildings we consider the public gallery. Although each building utilizes different materials and design features, the concept of flowing spaces connects them together. 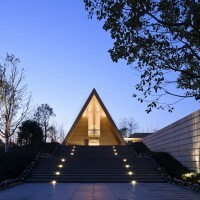 The Mei Li Zhou Chapel serves as the gateway to the project in both architecture and nature. Its simple plan, vast interior space and large open facades allow for the seamless flow of nature and natural lighting into the building. Along with the two large openings at the front and rear of the chapel, a series of large vertical skylights are located over the pulpit creating a very ephemeral feeling within the church. The Garden Chapel and Courtyard Offices also attempt to bring nature in, but on a much more delicate level. 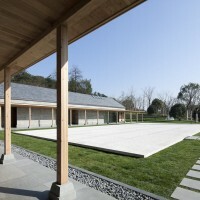 While the Mei Li Zhou Chapel utilizes its height and large views to bring nature in, the two smaller buildings use very carefully placed floor level windows to allow the spaces to flow seamlessly. 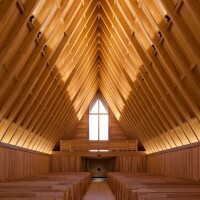 Although both the main chapel and the smaller buildings evolved from the same concept, the resulting design and created views are quite unique. 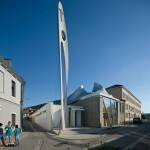 Not only the buildings allow for the seamless flow of space throughout the project. Situated in the center of all three buildings and housing the Bell Tower is a large outdoor public Courtyard. The courtyard acts as a device, which continues through each of the three buildings, connecting them to each other as well as nature. 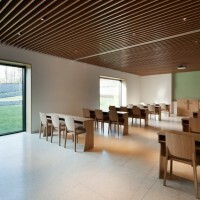 In the two gallery buildings, each room is carefully connected to this courtyard creating a series of interconnected spaces. Each space is unique and offers different views of the surrounding landscape. This sequence of flowing space guides people on a path, encouraging them to explore the buildings and all of the experiences they have to offer. 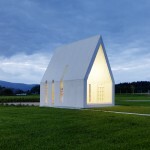 On the other hand we examined timelessness and purity and what that means for the architecture and its inhabitants. How can a fixed object, within an ever-changing environment blend seamlessly from the changing colors of the seasons, to the changing of people’s beliefs and cultures? For us this timelessness was found in the materials and details. 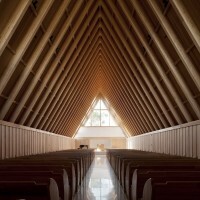 This timelessness can be found in the main chapel, and its wood structure. Stripped of all decorative elements, this building stands pure and dignified. In a time when concrete and wood structures are norm in Chinese construction, our structure looks to a more traditional Japanese system. Designed and constructed in Japan, the engineered wood roof allows for a beautifully detailed column-less space of 11M x 35M. 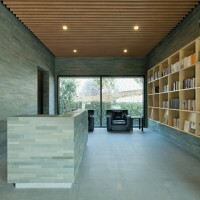 Besides the wood structure, the walls are clad in unfinished wood, in contrast to the white tile flooring. Timelessness is created in the colors of the wood, light, and openness of the interior spaces, which are constantly changing in conjunction with the changing of nature surrounding the building. 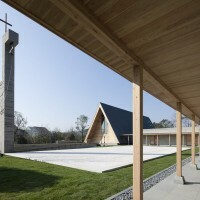 While the Main chapel attempts to blend in more with the surrounding forest, the two gallery buildings take on a more monolithic materiality, blending in more to the surrounding landscape. 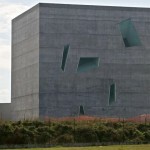 With a more minimal approach to detailing, these buildings use materials such as poured concrete on the exterior, and a lighter wood finish in the interior to play with the contrast between light and heavy. The surrounding landscape also utilizes local stones, treated in the same untreated way allowing for each stones nature and character to be elegantly expressed. 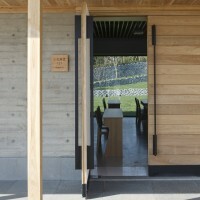 Visit the Tsushima Design Studio website – here.